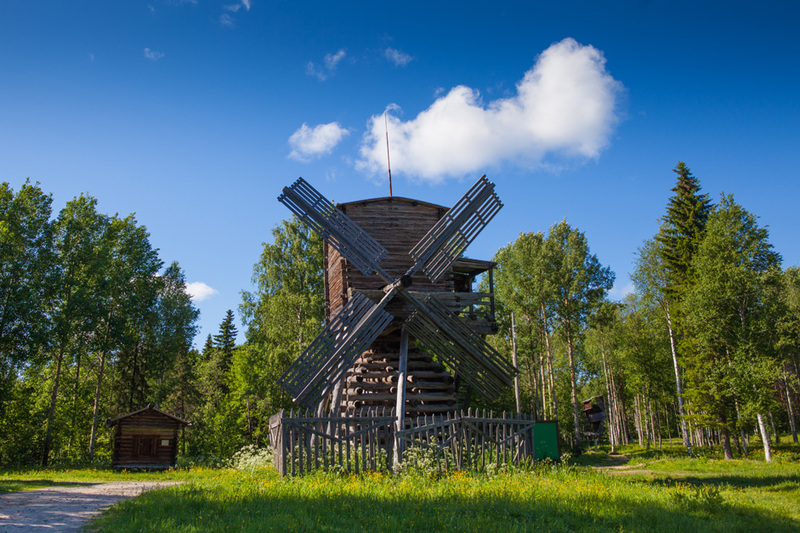 In the Far North, 25 kilometers from Arkhangelsk, near the village of Malye Korely, lies a museum of wooden architecture and folk art. 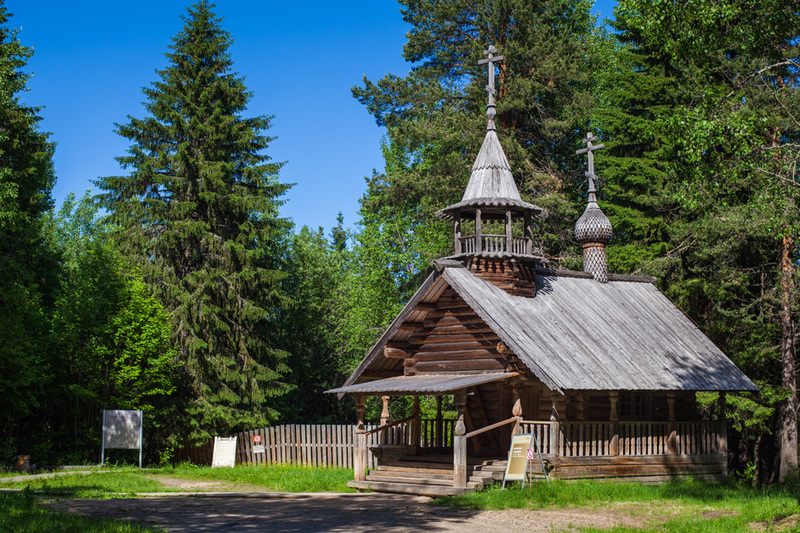 In the Far North, 25 kilometers from Arkhangelsk, near the village of Malye Korely, lies a museum of wooden architecture and folk art. 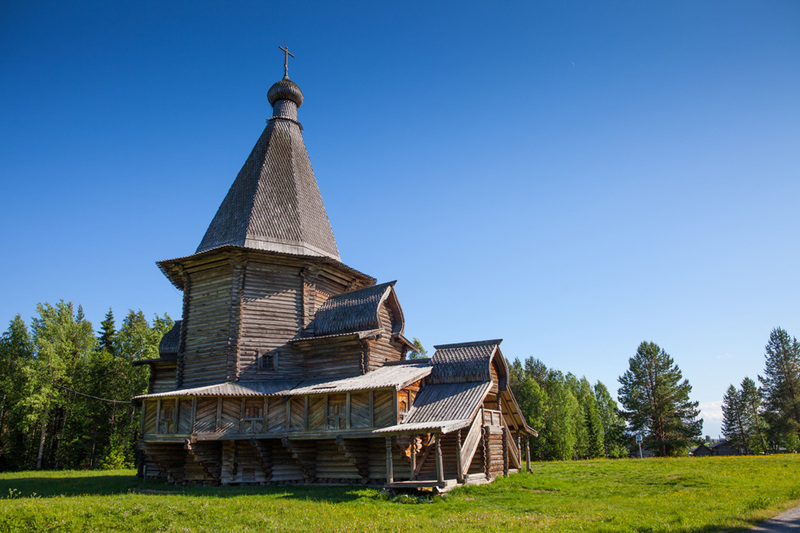 The location of the museum is no accident: Arkhangelsk's surroundings are some of the most picturesque in Russia. Church of the Ascension, 1669, Arkhangelsk region. This is one of the most outstanding examples of a 'kubovaty' cathedral; in other words, it has a quadrangular coating of complex shape. // There are six sectors on the museum's territory. Each sector is modeled after an historical settlement featuring characteristics particular to a district plan and the most typical buildings. Four sectors have been completed to date. They contain 120 monuments: churches, chapels, cottages, barns, baths, mills and wells. The other two have yet to be built. 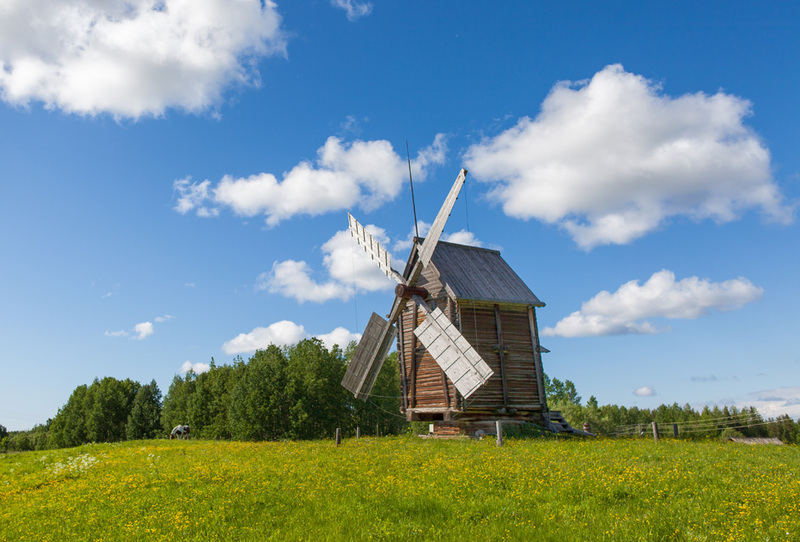 // Windmill in a 'crib', Arkhangelsk region. The windmill was built at the beginning of the 20th century. A vertical column dug into the ground forms the structure's base around which the cribwork is erected. As a result of the Russian-Swedish War, western Karelia went to the Swedes in the 17th century. 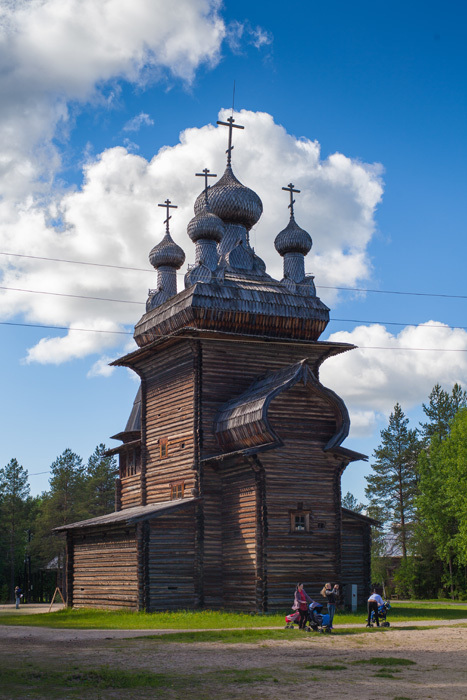 Tens of thousands of Orthodox Christians from Karelia started to leave their motherland and move southeast, to the Tver province, as well as north, to the west coast of the White Sea and to the lower reaches of the Northern Dvina River. The settlers were quickly Russified. Only the names of villages and rivers hint at the origins of the locals. 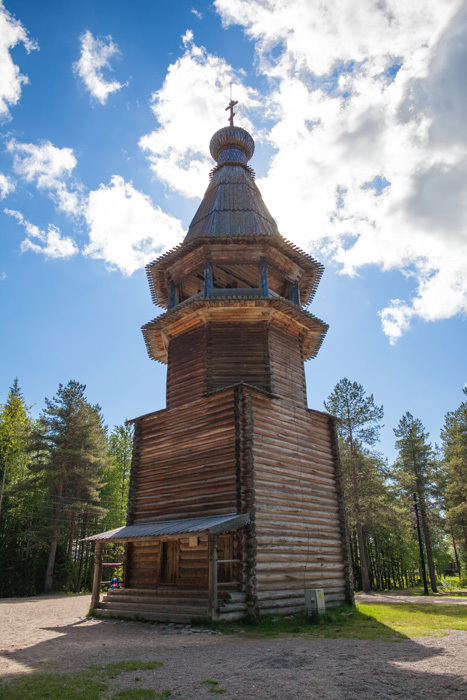 // Bell tower, end of the 16th century, Vologodskaya region. The bell tower from the village of Kuliga-Drakovanovo is one of the oldest tower-type belfries in the world. It is also the museum's most archaic monument. 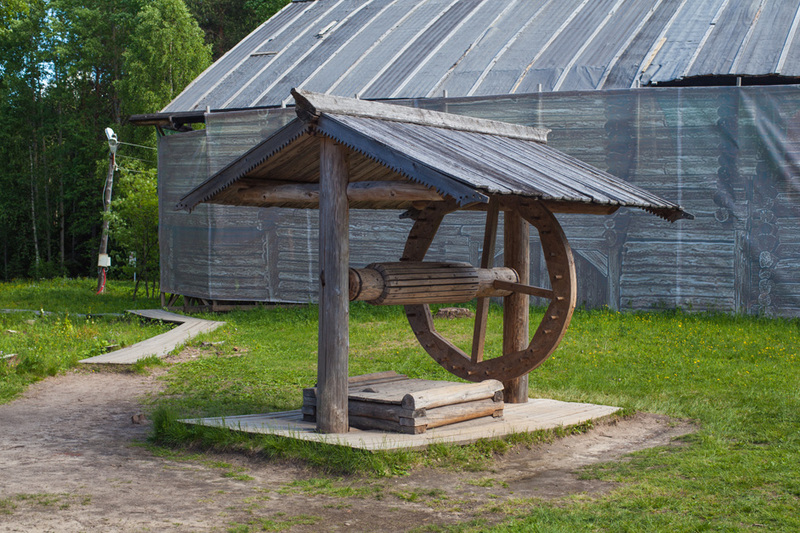 All facets of the rich North Russian culture are reflected at the museum, particularly peasant architecture. 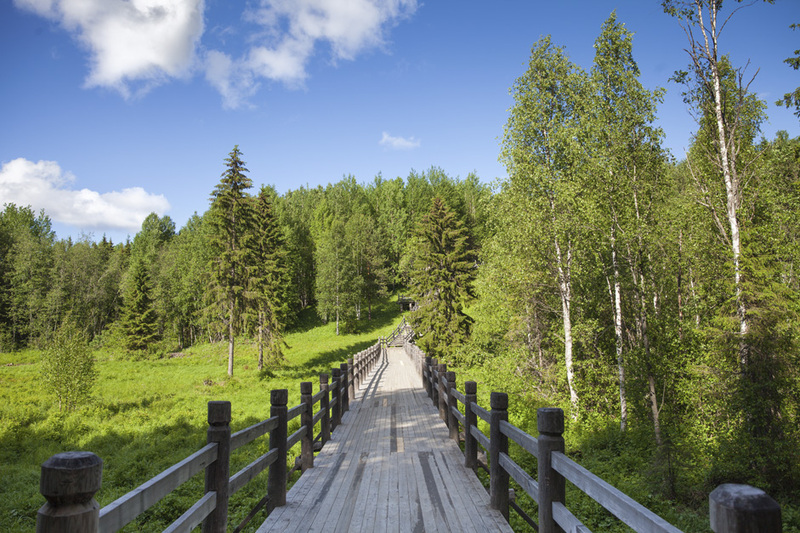 Back in the 16th-17th centuries, foreign travelers were inspired by Russian carpenters' mastery of construction. They could build huts, mansions, and churches with the use of a single axe. The builders did not use designs or plans, relying instead on their own experience and examples provided by their ancestors. // Chapel of Macarius of the Yellow Water Lake and the Unzha, the Miracle Worker, 18th century, Olonetskaya region. The chapel has a small bell tower. 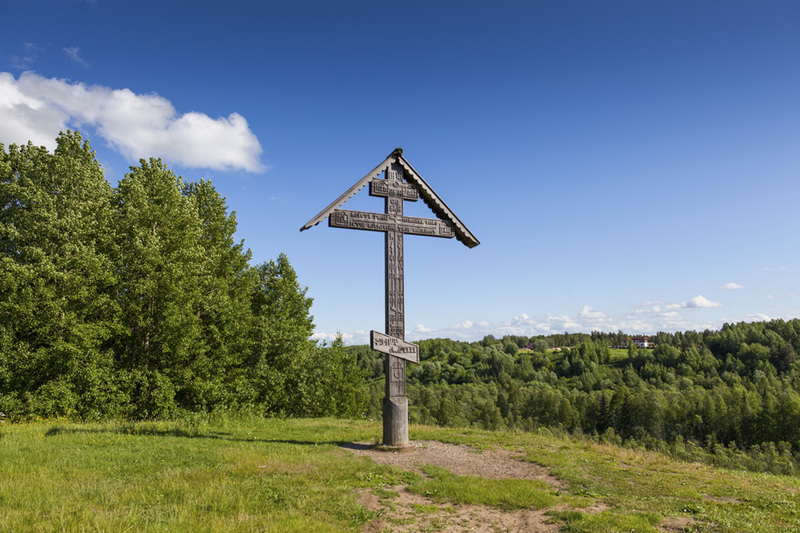 Votive cross, 1899 (copy), Arkhangelsk region. Votive crosses were erected under a vow given to God for his support in the hour of danger or for getting rid of any evil. The crosses were often covered with carvings depicting the crucifixion, as well as traditional symbols and abbreviations: Calvary, a spear, a reed, and cryptograms, which were meant to guard those nearby. Windmill on a frame, 19thcentury, Arkhangelsk region. The structural basis of the windmill is a vertical column dug into the ground. A frame of two rectangular crowns filled with stones encircles the column. 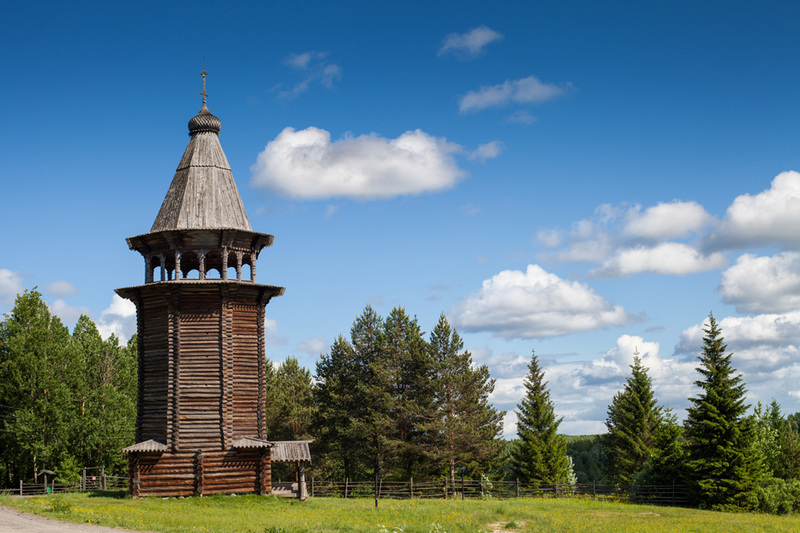 Bell tower, 1854, Arkhangelsk region. This is a typical nine-column bell tower. // Construction of the open-air museum began 50 years ago, and the first visitors walked through its its gates on June 1, 1973. 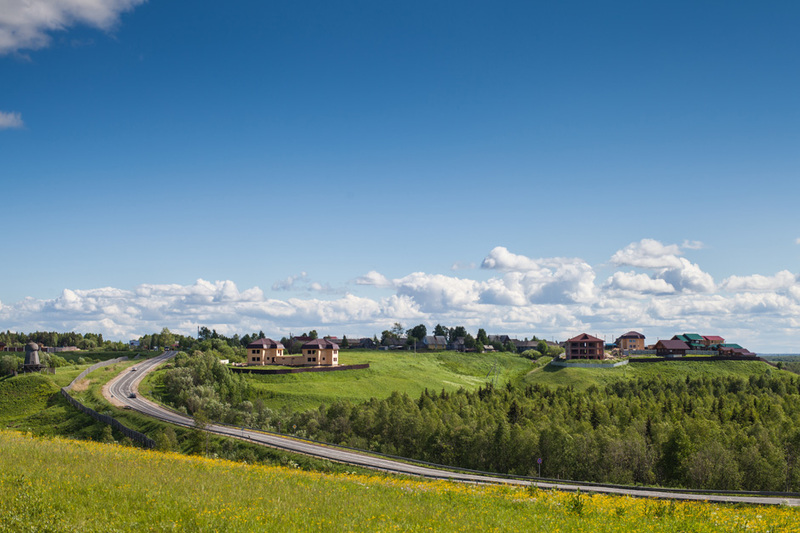 Today the museum covers 139.8 hectares of land. St. George Church, 1672, Vologodskaya region. This serves as an example of the marriage of rationalism and beauty which combine harmoniously in the minds of northern peasants. An octagonal frame surrounded by a covered gallery and crowned with a majestic dome with a canopy lies at the church's foundation. On the eastern side of the church's prirub is the alter, and on the west side is the refectory. 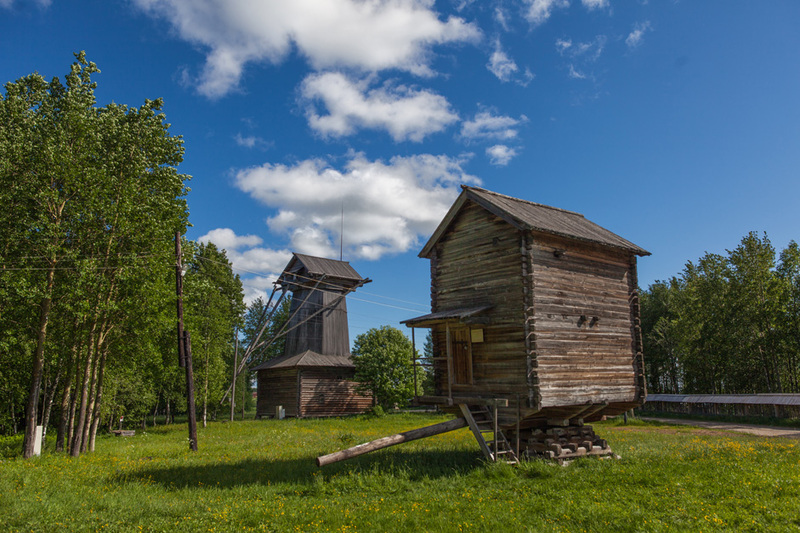 Today, the Malye Korely State Museum of Wooden Architecture and Folk Art of the Northern Regions of Russia is a unified area where visitors can immerse themselves in the atmosphere of the old North. The key idea behind the museum that gives it life is to create a spiritual bond between the modern world and the old world, to preserve the examples of the Russian North's culture, and to pay tribute to its unique color and majestic beauty.